Each year our parade committee looks for a parade grand marshall that is a great representative of our community. 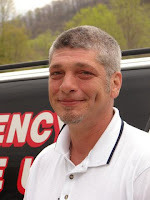 The 2009 Parade Grand Marshall is Ray Uttaro, Emergency Services Coordinator for Nelson County. Mr. Uttaro serves our residents at some of the most difficult times of their lives, with his committment to emergency services and compassion for victims and families of accidents. Congratulations Ray Uttaro and thanks for all that you do!